I'll confess, I'm no RTS savant; my strategy generally involves surrounding my base with defense turrets and sending wave after wave of disposable units at foes until I lose or, well, I lose. But that didn't stop me from donning my commander fez when some of the minds behind classics like Total Annihilation and Supreme Commander came to Kickstarter and pitched a brand new real-time strategy game, involving massive armies and a few large robots causing a ruckus. 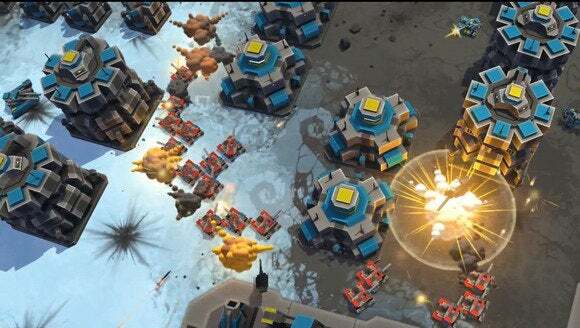 Oh how time flies—Planetary Annihilation is here (in Beta form), available to Kickstarter backers and through Steam’s Early Access program. If you didn’t back it on Kickstarter, getting in early will set you back $60. Sixty bucks. For a beta. Yikes. The early access release will give you a fairly solid impression of what’s coming down the pipe, with plenty of explosions and resources to gather and scads of tanks and robots charging across barren wastelands spitting rockets and the like. But the controls are a bit confusing, documentation is non-existent, and the occasional graphical and unit selection glitches can be a bit of a bother. There’s no single-player campaign, which leaves the action to online multiplayer matches—playing against AI opponents is possible, though the AI isn’t firing on all cylinders yet and can make for a subpar experience. Paying for early access nets you a few perks and this is shaping up to be an awesome game, but… sixty bucks, to essentially be a playtester on an unfinished product. Hrmm. So Planetary Annihilation: it pretty much does what it says on the tin. There isn’t much in the way of lore yet, but that’s never really been especially necessary in the RTS genre. You’ll start by picking a landing site for your massive Commander robot. These guys are special, being the only units in the game capable of building things and fighting. But lose them and you’ll lose the match, so bringing their firepower to bear will likely be restricted to the extremely skilled (or desperate). Things unfold in typical RTS fashion: send your Commander out to build metal extractors on metal nodes and plop down some power plants to get the resources flowing in. Then build your first factory, and fabrication units—these little tykes can take over construction tasks, so your sluggish Commander doesn’t have to trudge around so much. There are Air, Ground, and Sea variants for military and fabrication units, each with their respective merits and drawbacks—loading up on Air fabricators will let you cover more ground, by even rookies like myself will have scout planes buzzing the map, using their anti-air capabilities to pick off fragile, unescorted units. Productive robots are happy robots. Resource generation is interesting, as you aren’t tracking stockpiles so much as flow: every extractor and power plant pumps out X number of resources, while Y resources are being consumed by every factory or fabricator you’ve got cranking on projects. Run out of resources on hand your production efforts will continue to churn along, albeit at a much slower pace. This creates an interesting dynamic, as players who tend to expand aggressively can theoretically be handicapped by strategic attacks on resource sites. At least, that’s the way most of my losses have panned out thus far. You’re going to want to see that one in action, so here’s an appropriately explode-y video. Yeah. The thought of that sort of orbital bombardment was enough to get me to shell out my hard-earned ducats well over a year ago. But is a $60 price tag warranted? To be fair, the prices the devs are charging for early beta access are right in line with what Kickstarter backers paid last year, so if you’ve really been chomping at the proverbial bit to get your Annihilation on, this one’s for you. There’s no word on what the final cost of the game will be when it launches in December, though the developer’s FAQ suggests it’ll ultimately cost no more than $40. My advice? Wait. The developers more than doubled their Kickstarter goal, so this game isn’t in danger of being underfunded. With a few months of polish, Planetary Annihilation will evolve from interesting diversion to a solid, fascinating take on a genre that hasn’t seen much action lately, and you’ll be no worse for the wear, being forced to wait another two or so months to see it come to fruition.